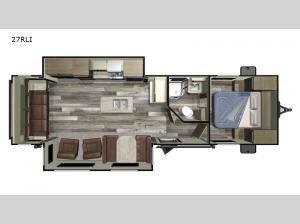 Come see just how easy it is to camp with this double slide out 27RLI Autumn Ridge Outfitter travel trailer. 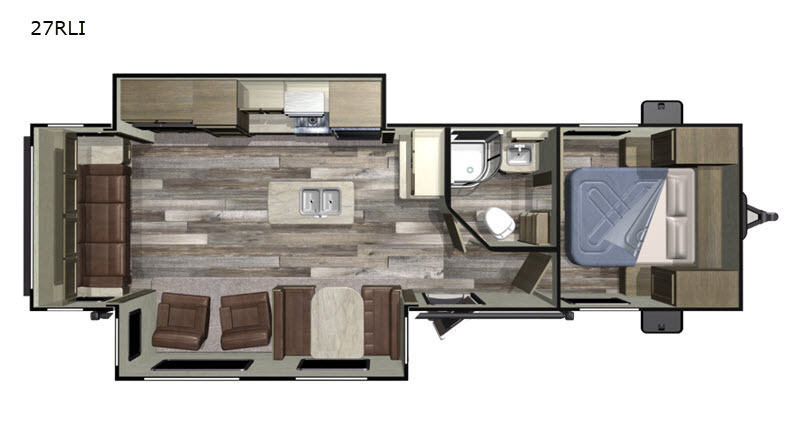 With double slide outs in the combined kitchen and living area there is plenty of space to relax, visit with your family, or prepare your meals. In the rear living area, the seating options are endless between the booth dinette which can also be transformed into an extra sleeping space, the two lounge chairs, or the sofa. The kitchen island has a double sink with a residential-style high rise faucet, plus extra counter space to make your meal prep a breeze. At night, you can come retreat to the front bedroom where you will find a comfortable queen bed plus closets for your hang up clothes, and an easy access sliding door which leads into the bathroom.